Select a high quality frp duct rodder must be judged according to the cable. We all know that electricity has become an indispensable source of energy for people’s daily life, but this energy needs its own way, that is, cables, which can only be delivered to users through cables. Therefore, whether it is residential building or factory building, Is unable to cross the work. Conventional cables are laid outside, but as the level of technology increases, the cable will be laid inside the wall, through the threading pipe to reach tens of thousands of households. Although this led to the development of threading plant, but it also brought some difficulties in cable laying. 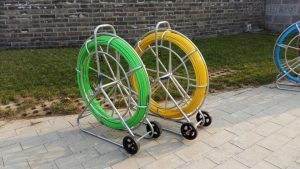 People’s wisdom is endless, in the face of difficulties people never give up, the emergence of FRP duct rodder device to solve the difficulties of cable laying. Because the cable is available in a wide variety of models, the threading device must be of a different type to better support the cabling. Of course, these are all specifications that do not need to worry about how to choose. For more information, please visit our website: www.sintafrp.cn, or contact us with E-mail, our E-mail address is frp@frpnews.com, you can call our boss straightly: 008615930159213,this number is also whatsapp number.